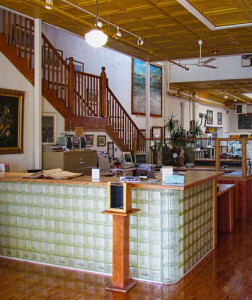 The Raton Museum has continued to provide residents of the City of Raton and the traveling public with a year round venue offering art, history and research facilities. The Raton Museum continues to be the leading organization for the collection, management, maintenance, and preservation of historically significant artifacts. Our historic walking tour brochure has been a favorite resource for tourists when visiting our historic district. IT IS IMPORTANT TO REMEMBER THAT CULTURAL TOURISM IS ABOUT THE REAL EXPERIENCE; ALLOWING THE PUBLIC TO SLOW DOWN, TO INTERACT AND LEARN ABOUT OUR HISTORY. Within the Raton Museum walls is the story of our rich and exciting past. Stories such as that of the early travelers, trappers, traders; a story of pioneers settling the west, expansive ranches, the battle between railroads for access to larger markets, the development of mining within the region and stories of people who helped to sculpt the rich and diverse culture of our community. 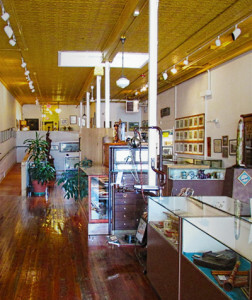 The Museum’s goals are to preserve history and culture by collecting, preserving, and presenting documents, photographs, tools, clothing, artworks, and other artifacts that played a role in the ongoing story of Raton and Colfax County. The collection consists of Indian artifacts, history of the Wooten Toll Road and the Clifton House, along with items found along the Santa Fe Trail. Photographs and artifacts record life of Colfax County’s early farming and ranching communities. The Raton Museum has an extensive railroad exhibit and is a must for railroad buffs. Artifacts and photographs from many coal camps represent a significant part of Raton’s history and contributed to the cultural diversity of our community. An annual Veteran’s exhibit features military uniforms and artifacts, and a history of the roles played by citizens during their service in the armed forces. The Raton Museum’s extensive photograph collection continues to grow through the generous contributions of patrons and serves as a valuable resource for research, education, and presentation of programs on regional history and personalities. Located on the Old Santa Fe Trail; in the heart of Raton’s historic district sits the 100 year-old building that was purchased and renovated with the generosity and support of the community. The Raton Museum is approached by numerous state museums and other program developers to participate and host exhibits and programs which broadens our image and brings further recognition to our community and The Raton Museum.